This is carried out according to very precise rules with the objective of limiting the yield. 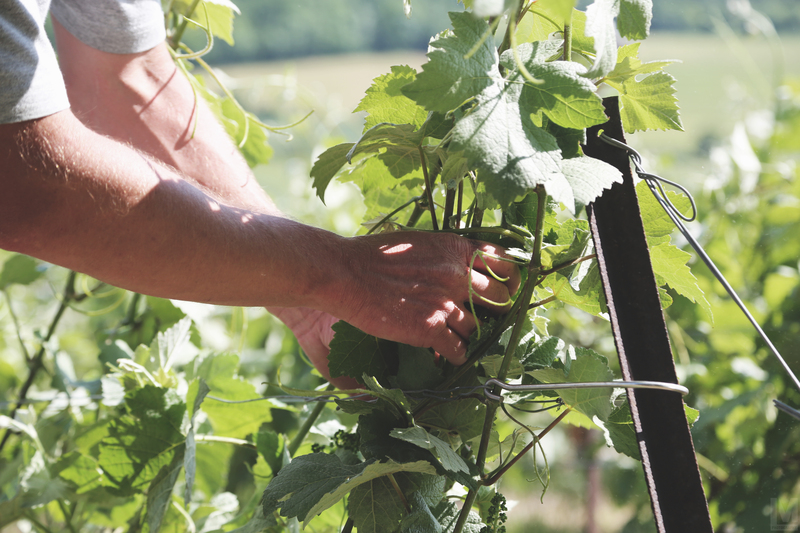 The only methods authorized are: Chablis pruning, Cordon de Royat pruning, Guyot pruning and Valléede la Marne pruning. We can start when the leaves have fallen. This involves binding the vine’s branches to wires. We remove the unnecessary buds to assure quality of grapes. The shoots of the vine are directed upwards so that they benefit from more light. These grape bearing shoots are attached to wires above the vines that provide the necessary support. The lifting takes place before flowering. For information, the harvest begins around one hundred days after the middle of flowering period.ur. The trellising consists of placing clips, having ensured an even distribution of the foliage, to attach the shoots to the upper wires. The objective of the trellising is to encourage photosynthesis by providing good ventilation to the foliage. Good distribution of sugars between the plant and the fruit is a major factor in the quality of the grapes. With the tractor, we cut the shoots on the top and on the side. This task is important in order to remove the unnecessary shoots that rise up seeking light and risk depriving the grapes of nutrients and light. We protect the vineyard against pest and diseases. Appropriate treatments are carried out based on the advice of specialists and with due consideration for the environment. The picking of the grapes is subject to strict procedures. It must be done by hand so that the bunches arrive at the presses intact. Harvesting machines are forbidden The bunches are placed in small baskets. The baskets are dotted with aeration holes to avoid asphyxiation and overheating of the berries, and to encourage any rainwater to drain away. As soon as the bunches of grapes are picked, they are taken to the press-house. Our press has a load capacity of 6 000 kgs of grapes in whole bunches. The pressing can begin and will carry on 3 until 4 hours. 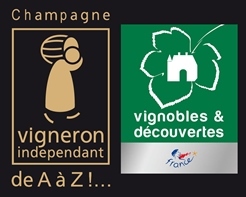 We will obtain 30.75 hl of « cuvée » (first pressing) and 7.5 hl of “taille” (second pressing). The different juices and the different grapes varieties are therefore vinified separately. The must is then transferred into small tanks called “Belons”, to proceed to natural racking. The lees, also called foreign materials, will fall by gravity at the bottom of the tank during 12 to 24 hours. Before the fermentation, if the sugar level is not high enough, we will add sugar to the must. This is called “Chaptalisation”. The aim of this step is to turn the must into wine. To do so, natural yeast are used to transform sugar into alcohol. During the fermentation the temperature rises and is maintained at 18/20°C to keep the finesse and the aromatic complexity. To keep the same temperature at all times, our vatting house is provided with Stainless stell tanks that are Temperature-controlled. This fermentation transforms strong malic acids into sweet lactic acids. It gives to the wine less acidity and more refinement flavours and assures a greater stability in the future. The malo-lactic fermentation is less intense but longer then the alcoholic fermentation. The work of the yeasts during the two last fermentations creates deposits int the bottom the tank. Therefore we rack the wines a second time. This is an important step in the champagne-making process. This step of harmonisation keeps the same typicity of our champagnes each year. It is the heart of a precise selection different grape-carieties, different juices and different years. The aim of this stage is to cool down the cuvées that just have been blended, which gives a clean and stabile wine. If this process is not made, it could lead to gerbage, where the bottle empties completely when opened. Indeed because of a thermal shock tartaric crystals can be created. At Spring, we bottle our production during 2 days with about 4 500 bottles an hour. For this step we use the help of provider who helps us bottling. 2 to 3 persons are in charge of putting the empy bottles on the chain. Each of the bottles are filled up with wine and closed by a capsule. After, 5 to 6 persons get the filled bottles to organize them, in order to store them for the ageing on laths. The “Prise de Mousse” begins 3 to 4 days after bottling. The cellar has to be at a constant temperature, so that the creation of bubbles and pressure will be optimum. It is therefore one of the most delicate step of the Champagne elaboration. It is what is going to make the difference between a wine and a sparkiling wine. After the finished foaming, the bottles will age in our cellars to reach their maturity. In Champagne, legislation sets minimum periods. There must be at least 15 months between the draw and the expedition for non-vintage champagnes. For vintages, the period is extended to 3 years. To remove the deposit generated by the yeasts from the foam intake, we proceed to stirring. This gesture, carried out manually or automatically, consists in lowering the yeast deposit into the neck of the bottle. Using the desks, this operation lasts 1 month by turning the bottles by hand every day. With the gyropalettes, this operation can be carried out in 1 week. Disgorging consists of opening the bottle and expelling the bottle, housed in the neck. The neck of the bottle is immersed in a solution at -25 ° C. At the opening of the caspule, the pressure expels the ice-cube containing the deposit. The bottles remain open for about 30 seconds. Then the bottle receives a dosage liquor to replace the loss of wine and give the champagne personality. The dosage liquor determines the type of champagne (crude, semi-dry, extra crude) by adding cane sugar and old wine. After the incorporated liqueur, we put the cork and the muselet. Two months after the disgorgement, so that the dosage liquor and the champagne mixes well, we dress the bottles with their festive clothes. So, our bottles are ready to beautify your tables.